One of the compact top loaders of GE is the WPRE6100. It has all the basic features packed inside its slim and trim body. The GE WPRE6100G is a washer that makes laundry cleaning a not so difficult task even for people who always seem to be on the go. It has auto soak, second rinse options, and the easy care cycle that does a fine job at cleaning different types of fabric without ruining the very hems and strands. Though the GE WPRE6100G is smaller than other washing machines out there, it's 3.5 cu. ft. capacity tub can just as well take on moderate loads in one go. Its wide opening at the top easily opens and fits in even large loads such as towels, comforters, or curtains into a stainless steel wash basket. Users can easily set the washing cycles for their laundry with the rotary electronic controls on its dashboard. They can also keep watch over the washing cycle, thanks to the cycle countdown and washer control selection displayed on its LED screen. Cycle status lights also allow them to see, even from a distance, the progress of each wash cycle. The GE WPRE6100G is a washer that helps save on energy and water usage while getting rid of germs and stubborn stains through the PerfecTemp™ water temperature system. This water system helps save on water and detergent by heating up the water used for the initial rinse so that germs are killed by the heat and stubborn stains are easily shaken loose. Clothes are then treated to a bath of cold water to preserve the color and quality of the fabric. There are five wash/rinse temperatures to choose from. Water levels are also automatically adjusted depending on the weight of the load. The bleach and fabric softener dispenser does a good job at expelling the said laundry solutions evenly throughout the load. In other conventional washers, clothes are spun and tumbled hard during the washing process that they end up knotted together and even damaged. With the GE WPRE6100G, dirt and stains are effectively washed out without causing too much distress on the fabric. Thanks to its GentlePower™ agitator, the GE WPRE6100G takes care of their clothes as if it they were hand-washed. This washer has a multiple number of wash cycles to take care of the laundry no matter what the type of fabric is in it. To take care of stains on fragile garments, the Delicates cycle can wash out the dirt without inflicting damage on the fabric. If it's the care and the thoroughness of handwashing that's needed for certain types of clothes, the GE WPRE6100G has a Handwash cycle that won't harm or tire the hands. Cotton fabric receives the proper treatment and care with the Cottons cycle (with regular extra heavy soil, regular extra light soil, regular heavy soil, regular light soil, and regular medium soil options). There is also the Casuals cycle with pulsed heavy and medium soil options. If the detergent needs a little more time to work its magic, this washer has a 15-minute and 30-minute Auto Soak options before the washing process commences. For those who want to do their laundry in a jiffy, the Easy Care cycle with heavy, light, and medium doil options can give a quick and easy clean without eating up too much time. The WPRE6100G's efficiency just doesn't stop after the suds have been rinsed away. In fact, this washer also has a second rinse option to effectively flush out any detergent residue from the laundry. A quick rinse option is also available. This washer also serves as an effective spinner, squeezing out excess moisture from the washed laundry. Some consumers have cited the efficiency of GE's WPRE6100 in regulating the use of water, energy, and even detergent during operation. It is also a bit more affordable than others considering the many features packed into its compact body. This washer also has an AutoBalance™ Suspension System that keeps the machine from vibrating too much when in use. Basically, the main advantage of using this washer is its high quality cleaning performance, especially when settings are chosen well. Despite its ability to cut back on water and detergent usage, the GE WPRE6100G isn't ENERGY STAR Certified. Also, some users have complained of an annoying hums when the washer is fully loaded. If you want a washer that performs more than just your basic wash-rinse cycle, then the GE WPRE6100G could be the right one for you. At approximately $500, you'll definitely get a bargain with this kind of washer. Takes to long to wash. I could do 3 loads of laundry before work each morning with my old GE Washer. Now it takes a minimum of 69 minutes just to wash for a small load. A large load, 79 minutes. With the anti-bacterial in our detergents there is no reason a wash cycle should take as long as it does. I would never reccommend this washer to consumers! I hate this washer! I have owned and used this machine for about 5 years now and it has met my needs as I expected. I like I can wash very large loads- larger than other models I have owned. The wash time is as expected and it allows me many different wash settings. It is especially convienent that it allows me to choose load sizes in between the standard sizes. The control panel is nice. It has many different wash options- a hand wash seperate from the delicate option works well for more delicate loads. It has an option for very cold climate that warms the cold water slightly to a temperature that's better for disolving the powdered laundry detergent that comes in handy in the wintertime. I've never had a problem with undissolved detergent left at the end of a load. The only thing that is lacking is with the instructions that are posted on the inside of the lid of the machine. They aren't specific to the machine, more of a generic wash whites in hot, wash darks in cold. It would be nice to have a quick guide of the actual options available on this machine handy under the lid. My only other complaint it that it is quite loud when it is in it's spin cycle. But all in all, it is a great washer and has served me well over the years. I've had my machine 2 years and also just had the mode shifter and motor replaced. G.E., being so kind and generous, did not charge for the new parts, but the labor was $185.00. I've hated this washer since I got it, it takes FOREVER to fill and longer to wash, and now I see from other reviews that I will probably now be having chronic mode shifter and motor problems. I will never buy another GE product. Be very wary of buying this washer! The washer performs well but has had two (2) repairs of the same component in six months since purchased in fall 2008. The shaft and mode shifter has broken twice. This is the part that shifts the basket into spinning during spin cycles and is supposed to keep the basket stationary during washing. The agitator in the center is the only thing that should move during the wash cycles, but in our case the entire basket moves during the wash, which spills water out the overflow on to the floor. As I said it has failed twice, and Sears policy is to not replace the machine unless there are four (4) repairs in one year. since we bought a 3-year home maintenance plan we'll probably jsut keep repairing these as they continue to fail and probably buy a different brand later. I bought my GE Profile King Size Capacity washer 2 years ago (4/12/07), and paid $541.00 for it. The manufacturers warranty only covered it for 1 year (it gives you 5 years on certain parts, but the big stuff, like the motor, only gets a year...) That should have been my first red flag. As of yesterday (5/28/09), my washer will not agitate or spin. Customer service wants to send out a technician for $75.00 to see what's wrong. Then they want to charge me for parts and labor to fix it (which will be well over $200--just over 1/3 of what I paid for it...). For only having the machine for two years and something MAJOR being wrong with it, making it completely inoperable is very disappointing. GE Customer Service, though nice and friendly, was not very helpful. They are limited to GE's corporate policies and won't bend. I will very likely be purchasing another machine in the next few days and I WON'T even consider another GE product. They have lost my trust and my business forever. I love this machine. The capacity is huge and I have no problem washing a large comforter in it. The noise level is very low and, at first, I didn’t even know if was working. Having had my previous GE for twenty years, and having had luck with my other GE products, I looked at the brand again. I didn’t want to spend more than $500 on it and think I paid around $470 for this one. For the price, I was surprised to get nice features like the touch screen and stain wash. I also got an excellent warranty. 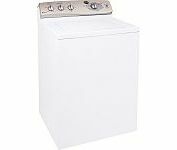 The GE is very reliable and not only does it clean well, but I don’t have any problem with putting fine washables in it as the gentle cycle is really gentle. Nothing has ever been ruined. One thing that used to drive me crazy on the old machine was constantly having to stop the cycle to redistribute the load as it would keep getting unbalanced and bang around the drum. A couple of times, it shimmied off the platform. This machine does not seem to do this. It is a great thing not to have to run down to the cellar every few minutes whenever I washed towels. Naturally, heavy loads were the worst. Love this machine and would buy again. I have a GE washing machine WPRE6100GWT and I grade it a 5 as it is very reliable.I have had it for 8 years and no problems with it.These have a lower cost than other brands,but I like mine better.This has a very large capacity for clothing which means I will be doing less laundry and saving electricty by using it less often.